But for those times you need a personal notebook to take notes and diagram basketball plays and drills, check out the ‘Basketball Notebook‘ from Hoops U! Get nearly 100 pages of court diagrams and note-taking space in a durable spiral-bound notebook. Great for use at clinics, when watching games, and to simply have one nearby for when the ideas hit! You can also have it customized for your clinic, team, or program! Makes a great gift to fellow coaches and staff! Get The Basketball Notebook now! For single-page, printable basketball diagram sheets you can use now, check out the basketball court templates and diagrams below. Use these printable basketball court templates for scouting, for practices, for drawing your own plays, for your basketball notebook, or as fire starters. Whether you need a full court diagram or a half court diagram – or both – these basketball court diagrams are free for your use! Choose your basketball court diagram option below. 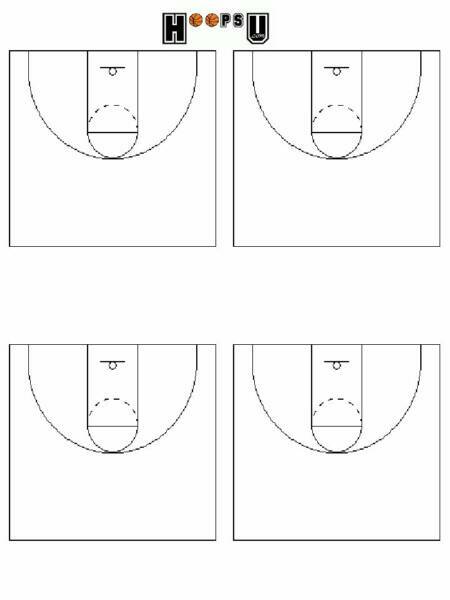 You will find the half-court and full-court diagrams in .jpeg format as well as a combined .pdf file with 5 basketball court styles in 10 different diagrams. Complete set of blank basketball court diagrams including high school, NCAA, NBA, WNBA, and FIBA in an easy to download and print .pdf file. Full basketball court on one sheet. Four half courts on one sheet. Is there any that can fit one page that I can fit? Not quite sure of your question, Maria. Each basketball court diagram is on its own page. 1 fullcourt diagram on a page and 2 halfcourt diagrams on a page. Hi Tony, just in case, we have published here a free basketball court PowerPoint template that you can also use as a printable template. http://www.free-power-point-templates.com/articles/free-basketball-court-powerpoint-template/ It contains a full basketball court and half basketball court layout and is prepared for PowerPoint presentations. Hope you like it. Thanks Tony and FPPT. This was exactly what I was looking for. We have used the basketball court diagram in a PowerPoint presentation today. Great SlideHunter … glad you could use the resources!! is there a standard basketball court labelled?! What do you mean by ‘standard’? The pdf has blank basketball court diagrams for all the various courts (high school, college, pro, etc). The basketball courts are the playing surfaces consists of a rectangular floor. Generally basketball court dimensions vary slightly by its level. Several different variations of basketball court diagrams designed for scouting opponents, and drawing up plays for your team or just messing around at work. Many coaches go through the basketball court diagram for shot charting their team or opponents as well. In this blog, you have provided variety of court diagram and its full details. Really, it’s helpful for the coach to choose one of them by going through their specification. Basketball court sizes, in actual vary in overall lengths and width depending on the type of league. Although sizes differ with each other, courts marking are generally the same across all leagues.